A while back I made a prototype of the sliding element for T-slot. Since then there were a few tweaks to it, however it was never really tried in action. I received an email recently asking whether it was possible to use Contraptor to build contraptions of larger size (e.g. 2x4 ft). This would definitely call for T-slot - which I happen to have several standard lengths of (12", 18", 24"). 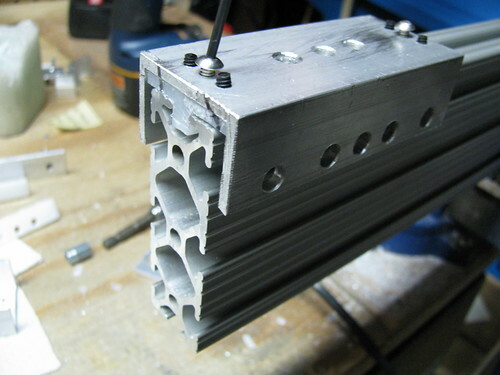 I also have several fabricated T-slider prototypes. To test a number of assumptions about how these sliders would behave, I intend to build a robot with light X and heavier Y driven by belts, and heavy Z driven by four leadscrews. The robot would be ~2ft in X, ~1.5ft in Y and ~1ft in Z - but it could be scaled up. The actual work volume would be smaller than these dimensions. The screenshot on the right is work-in-progress on that robot. So far I've assembled the basic T-slider belt drive. The test below uses Arduino GCode Interpreter and grblShield (1/8 microstepping). The speed is 600 IPM. It seems to be a quite clever design ( the screw in the middle ). 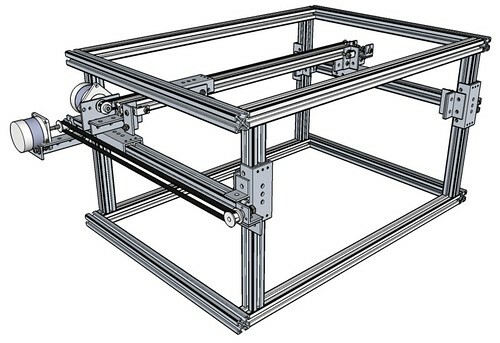 How will you drive the Z axis ? How well does this work compared to the linear bearings ? How much "play" does it have ? 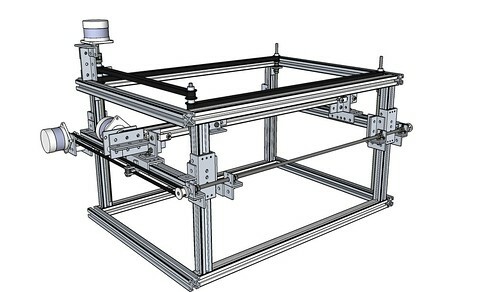 Z axis will be driven by four lead screws connected by belts in pairs, same as mini-CNC. With T-slot, the leadscrew would go to the opposite side from the sliding element (in the video it would be underneath T-slot). The T-slider is comparable to angle sliding elements in terms of friction and amount of play (and inferior to linear bearings). Where error of ~1mm is acceptable, it should be "good enough" solution. The element doesn't resist twisting so it either has to be loaded with weight from the top (like the Y axis in the sketch) or there should a connected pair of these opposite to each other (like the Z axis). The belt drive results are encouraging so far and I want to see how easy the friction adjustment would be in the opposite pair arrangement. Other than 1', 1.5' and 2' lengths of 80/20 T-slot, it uses the standard Contraptor parts, with the exception of T-sliders, flat motor mounts and 3 custom belt lengths for Z axis. 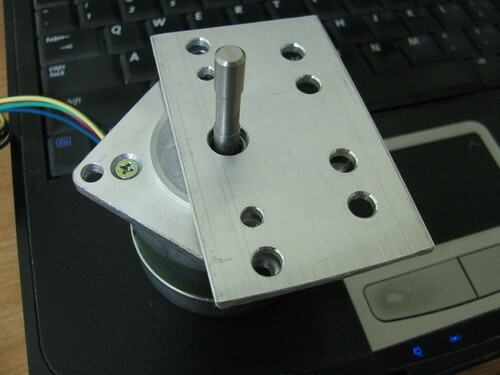 There are a couple of advantages of the flat motor mount over the current angle one - a) it's laserable, b) the motor center axis is on the line between mount points, c) it should also work with NEMA 17. I haven't extensively played with this mount in various arrangements (e.g. leadscrew), but so far it looks promising. I made a couple of prototype parts a while back, and I figured I'd use them here. 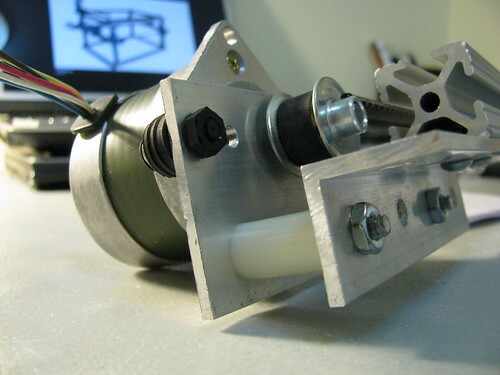 The motor assembly for both X and Y is mounted on nylon standoffs, which are cheap (<$10/100pk) and available in many lengths, including 1/8", 1/4", 1/2" and 1". There is often a need to add an eighth or a quarter inch of a padding between parts. The spacers/standoffs work well for that purpose in most places, unless there is only one attachment point (in which case parts turn relatively easily), or if surface to surface contact is needed for rigidity. For example, in the video below, a couple of 1/8" spacers would replace the orange plexi piece.